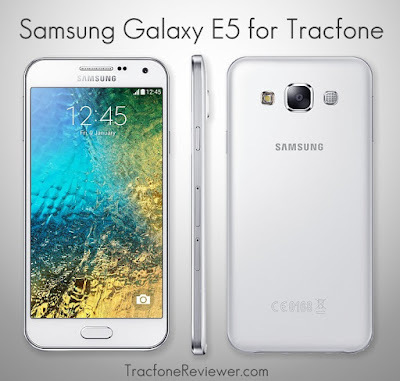 Below is TracfoneReviewers full review of the Samsung Galaxy E5 which is available to use with Tracfone prepaid service. We have many more Cell Phone Reviews which you can browse through, or simple explore the rest of our blog, which is all about Tracfone related information. The Samsung Galaxy E5 is an Android powered smartphone that was recently released to use on Tracfone's prepaid network. It features a 5.0" touchscreen and 16 GB internal memory plus much more. In this review we will share the full features and specs for the Galaxy E5, and then compare it to the S5 and some of other smartphones also available from Tracfone. We will also include where you can buy the E5, and if you really should or not. But first, let's cover the brief pro's and con's for this phone. The E5 has some really great features, but it also a lot of features that are similar to many of Tracfone's other devices, which mostly retail for closer $100. So is the extra cost of the Galaxy E5 worth it? We will answer that, but first take a look at the full list of features and specifications for the Galaxy E5 to get a better idea of all it has to offer. Size: 5.6" x 2.8" x 0.3"
As you can see, the Galaxy E5 maintains some features from the S5, but trims a lot of others. The phone's technical specifications are mostly reduced compared to what the S5 comes with, but they both have 16 GB storage and 4G LTE service capability. The E5 does have Android 5.0.2, and is a step up from phones like the Samsung Galaxy Core Prime or LG Sunset (which also have Android 5.0, but not as much internal memory, RAM or as large a screen). Before we get too far into comparison the Galaxy E5, let's look at some of the features that we really like about the E5, and some areas where it falls short of our expectations. There are a number of different features on the E5 that make it a very capable smartphone. We like the processor and RAM, the amount of storage on this device, and the screen and camera are also very good compared to other Tracfone devices. 1.2 Ghz Quad core processor combined with 1.5 GB RAM is a good combination and should be plenty of power to handle your everyday activities. Most of Tracfone's other phones, like the LG Sunset and LG Ultimate 2, use only 1 GB RAM, which means less multitasking capability and less ability to handle resource heavy apps. But, its no 2.5 Ghz quad core with 2 GB RAM which is what the S5 comes with. Do you need this kind of performance? Maybe not, but its still something to consider if you're comparing the two. The Galaxy E5 comes with a 5" Super AMOLED capacitive touchscreen at a resolution of 720x1280 (about 295ppi pixel density) which is very good. The LG Sunset only has a 4.5" Touchscreen with 480x854 resolution at 218ppi density. Samsung has a pretty good history of bright and beautiful screens (at least for their mid to high end devices) and the E5 is no exception. An 8MP rear camera with flash and a 5 MP front camera are great features and more than adequate for recording life around you. You can even record videos in full 1080 HD at 30 fps from either camera. Finally, one of the best (or maybe most desirable) feature on the E5 is the 16 GB internal storage (and up to 128 GB external with micro SD card). Tracfone smartphones have been plagued with small amounts of onboard storage for years, but we hope this trend is changing with the Galaxy E5 and S5 each coming with 16 GB. There are a couple of points we want to mention about the E5 that are drawbacks for those who might be considering this device. None of them are serious flaws, but issues non-the-less that should be covered. First off, the E5 uses Android 5.0.2. We initially thought it would come with only 4.4, since that is what the S5 has, but we are very happy to confirm it comes standard with 5.0. This is good news, especially those who are concerned about some of the possible security risks that Android 4.4 is susceptible to. With devices on Tracfone like the E5, you can't update them (as far as we have found). So you will have to stick with 5.0.2, This is a drawback for those who like to keep up with the latest Android updates, which bring not only new features to the phone, but also patch potential security risks. The best way to avoid security risks is to only visit webpages and apps you trust. Take a look at our list of Best Android Apps for some of our top picks. The Galaxy S5 uses the older, Android 4.4 OS, but if you buy the S5 unlocked (and bring it to the BYOP program), you can update it to Android 5.0. The second drawback for the E5 is the price. It is retailing on HSN.com for $350 bundled with minutes and other accessories. The airtime is worth about $100, making the phone cost about $250. Many of Tracfone's other smartphone devices, like the LG Sunset or Galaxy Core Prime, retail for under $100, and can be found bundled with minutes for around $100 (making the phone almost free). Roaming, as many are aware, is not currently available for Tracfone smartphones. What this means is, if you go outside of your service area (which, in the case of the E5 is Verizon cell towers) you won't have service. The good news is that Verizon has pretty good coverage in most places, but be aware that if you live in an area, or travel to areas, that don't have Verizon coverage, you won't have reception in those areas with this Tracfone device. That sums up the main points in our review of the Samsung Galaxy E5 from Tracfone and the pro's and con's for this device. Here's a our final thoughts on the E5, and where you can find it available for sale. While it has a less powerful processor, lower resolution camera, smaller and lower resolution screen, and less RAM compared to the Galaxy S5, the E5 does still have 16 GB internal storage and uses the newer Android version 5.0.2, compared to the S5. Truly, the E5 is the somewhat less capable little brother to the S5, but still quite capable, especially compared to any other smartphone available from Tracfone. The real issue is the price - at $350, you can easily get an unlocked Samsung Galaxy S5 and bring it to Tracfone with the BYOP program. You could also get many other great smartphones for closer to $200 and bring them to the BYOP program. So we find it hard to recommend this phone unless you are willing to spend the money for the convenience of avoiding the possible hassle of activating a BYOP device. If the cost isn't such a worry to you, then this phone is a great choice. But wouldn't you rather spend a little more and get an even better phone like the S5? Not everyone would need the extra performance, but it is always nice to have. We have not found the E5 available anywhere else, but will update if this changes. Visit Samsung's official product detail page for the E5 if you want to see additional photos and read the user manual. Also you can view an Interactive Tutorial for the E5 if you're so inclined. If you have any further thoughts or questions, leave a comment below. We do review each comment before posting. Stay up to date with the latest Tracfone news and info by joining over 1700 others who follow us on Facebook! And if you're new to Tracfone, start with our Beginners Guide to Tracfone which explains some of how using Tracfone service works. Update! We've received lots of great responses to our survey and have closed it. Thanks to everyone who shared their opinion, and look for the results in a future post! The TracfoneReviewer blog has been around for several years, and we are looking at gathering more information about what our readers are interested in learning. When we first started this blog, Tracfone had not released any smartphones, and all phones from Tracfone could accept promo codes. Times have changed a lot since then, with more and more users switching to Tracfone smartphones or even bringing their own devices to Tracfone. We want to learn more about what our reader base is interested in learning from our blog! We have created a short survey with twenty questions and would like to ask all of our readers to take a few minutes and fill it out. Give our readers an opportunity to share ideas for future topics and what they want to read! We are excited to give you, our readers, the opportunity to help shape the direction and topics of this blog for the future. We will be compiling the responses after a week or two, and share the findings in another post here on the blog! We are looking forward to providing some interesting pieces of information, including which phone is the most popular with our readers! 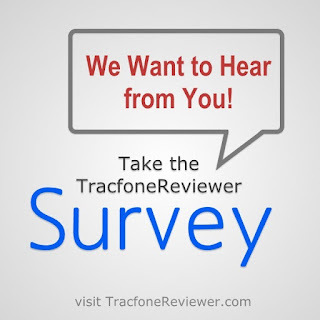 Remember that you only need to take the survey once, but you can share it with friends and family who also use Tracfone and would like to share their thoughts and opinions! We will also be posting updates and information on our Facebook page, so be sure to follow us if you haven't already! If you're looking for more regular Tracfone related content, take a look at our recent list of Tracfone Deals and Discounts or view the Review of the Samsung Galaxy S5, which is the most advanced phone Tracfone has offered. 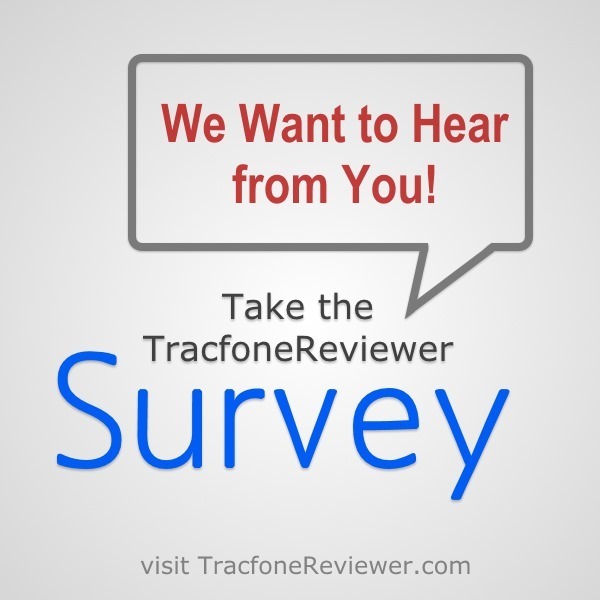 Thanks for helping make TracfoneReviewer the blog that it is, and if you have any questions about the survey, leave a comment below! TracfoneReviewer is a blog sharing independent reviews, news and information about Tracfone Wireless. We hope you find the information we share useful and be sure to check out some of the other posts we've recently created! Tracfone is a wireless prepaid cell phone company that provides both service and phones to use with their service. Tracfone devices can be found in a wide variety of locations from gas stations and retail stores, to a number of different online retailers. Prices for Tracfone smartphones and other devices tend to fluctuate, but generally get lower and lower the longer the device is available, and you can sometimes find great deals on phones. We are always monitoring prices and phones, and try to collect the best deals and sales we can find from around the web and share them here for your convenience. It is usually cheaper to buy a Tracfone device through a third party retailer like Amazon, eBay or HSN, rather than buy it directly from the Tracfone website. Airtime from Tracfone is not typically discounted, although you can use Promo Codes to get extra airtime for free when you are adding a prepaid card. Just remember that these codes won't work on any smartphones. 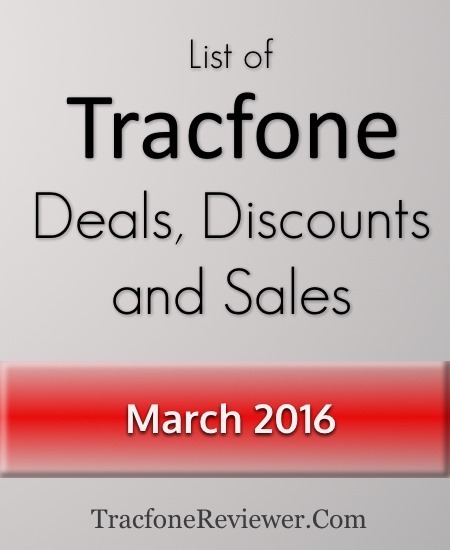 Below you will find several great deals on a few different phones from Tracfone. Leave a comment if you find any great deals and we'll add it to the list! These deals may not last long, so act on them quickly if you're looking to buy a new phone. The LG 306G is a non-Android phone with a 3.2" touchscreen and Triple Minutes for Life. 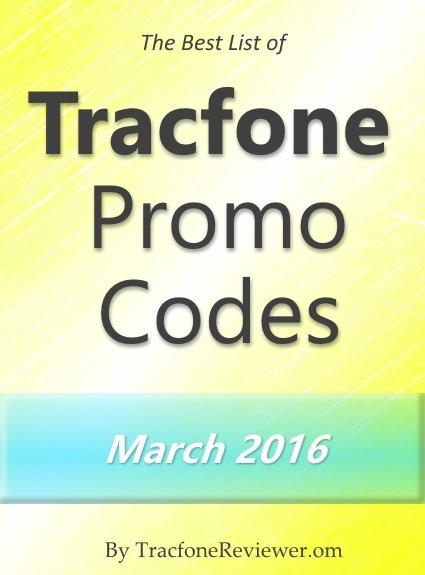 While this is an older device, the good news is you can still use Tracfone Promo Codes with it. Many users like that it is simple, and easy to use. It does the basic functions of calling and texting well, so if you need a simple phone, this is a great deal at only $10. Take a look at our review of the LG 306G for more details on this device. Running Android 5.0.1 on a 4.5" touchscreen, the LG Power is a popular smartphone choice for Tracfone users. It comes with 8 GB internal memory, 1 GB RAM, and a quad-core processor which is enough power to run almost all apps available. The Power is very similar to the LG Sunset listed below, except that the Power uses 3G CDMA technology for cell phone service. Visit our Review of the LG Power for more details and information on this phone. Check out the LG Power on Amazon for $59 where it also has an average customer rating of 4.6 out of 5. The LG Sunset has the same specs as the LG Power (4.5" touchscreen, Android 5.0) with the addition of 4G LTE capability on GSM networks (AT&T). If you live in a location with GSM service, the LG Sunset is a powerful smartphone that will give you access to the fastest speeds for downloading things to your phone using data. Take a look at our Review of the LG Sunset to learn more about this phone including full features and specifications. You can find the LG Sunset for $79 for just the phone, or bundled with 1 year of service and 1350 total minutes for just $99 through HSN. If you're particular about the color of your phone, you can also get a white LG Sunset through HSN with the same bundle, just select the 'white' version! When the Samsung Galaxy Centura was released a few yeas ago, it was one of the first smartphones available for use with Tracfone. Now, it is a fairly old phone that likely won't be able to keep up with the latest applications, but it does still run Android 4.0 and has 4 GB internal memory. What makes this phone stand out now is the price. At only $12, you can pick up this phone and use it as a dedicated music player, weather station, or many other options. 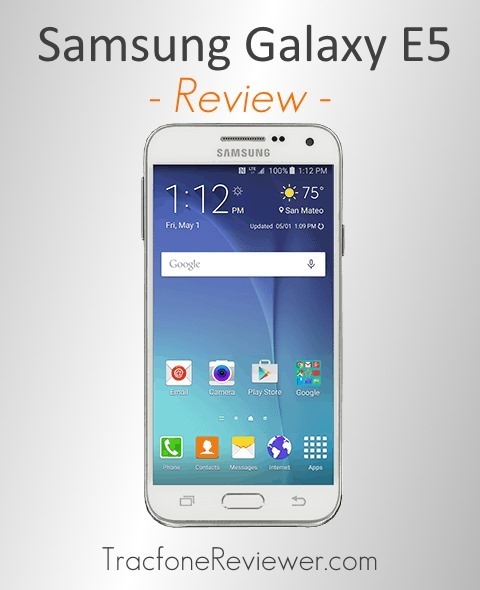 View our Review of the Galaxy Centura for more information on the phone. Grab the Samsung Galaxy Centura from Amazon for $12. That covers the current deals we've found, but we will update this with new deals and any that you share below in the comments! We recently posted on our Facebook page a great deal on the LG Sunset, so join that page if you want the latest news and information about Tracfone! If you're looking for a new phone, you should also consider visiting our Tracfone BYOP page where we share a lot of useful information about how the program works,, and include a list of phones to use with it. 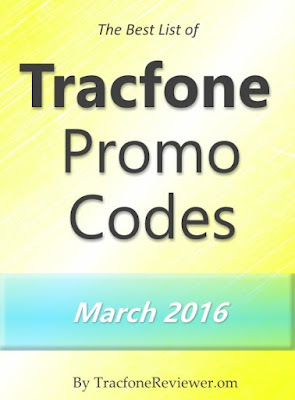 Each month TracfoneReviewer collects and shares the newest Tracfone promotional codes here on our blog. We also share lots of other information including cell phone reviews, news, and analysis. Tracfone Wireless is a prepaid cell phone company that provides cell phones and airtime to use with those phones. Airtime cards can be purchased from many locations including online, and come in a variety of amounts. The most common airtime amounts are 60 Minutes, 120, 200, and 450. Each of these cards also comes with 90 days of service. There is also a special 400 Minute/ 1 Year card that comes with a full year of service. Each time you add an airtime card to your phone (by using the PIN on the back of the card) you can also use a promotional code to get extra minutes for free. The promotional codes from Tracfone are usually meant for a specific card, but they will also work with airtime cards of greater value. For example, a code for a 60 minute card will also work with the 120 minute card, and the 200 and 450. A Tracfone code may only work once per phone, or sometimes it will work multiple times. Adding airtime either over the phone, or on the Tracfone website lets you try more than one code, in case the first one doesn't work. Tracfone codes won't get you extra minutes if you're using a smartphone from Tracfone, or a device on the Tracfone BYOP program. But these Android powered phones are still great, and offer a lot of features. We recently reviewed the new Samsung Galaxy S5 which comes loaded, so take a look if you're interested. Note, promo code for 60 and 120 minute cards is only working for some users. Those are the latest codes for March! We hope you are able to find a code that gets you extra airtime for free! Leave a comment with which code you used, and how it worked. If you're new to Tracfone, check out our Beginners Guide to Tracfone which will share some helpful advice and tips. You can also read our post on the Worst Tracfone Device, think you know which one we picked? And don't miss out on our Facebook page where we share the latest news, codes and more with over 1700 followers!